The use of such technology has unique opportunities for openness and anti-corruption across the globe. As part of the anti-corruption module of the International Masters in Public Procurement Management at the University of Tor Vergata Rome, Mihaly Fazekas, a post-doctoral research fellow at the University of Cambridge (UK) who has been pioneering the use of 'Big Data' for social sciences research, especially for measuring and analyzing corruption and administrative quality across Europe held a two day session with students there. Students were mid-career procurement professionals coming predominantly from Eastern Europe, Caucasus, and the Middle East from organisations like national procurement agencies, or large buyers such as hospitals. Hence, they were very familiar with public procurement processes, regulations, as well as types of corrupt practices. Mihaly was using R-Instat, a new open-source software for statistical analysis based on the widely used programme, R, their package provides a ‘front end’ that makes R much more user-friendly and accessible. The software, R-Instat, has been funded through crowd-sourcing and developed by a team from African Maths Initiative. It is set be launched in Morocco in July this year. 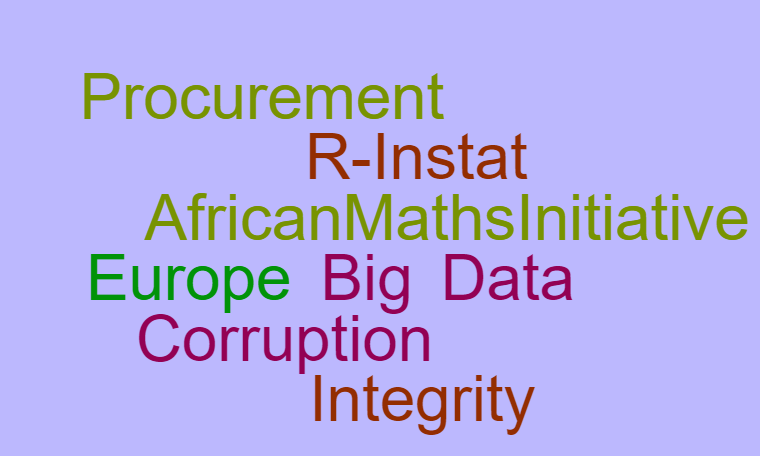 The software has a specific menu, corruption risks menu whose features allow the measurement of corruption risks and help in raising red flags in public procurement. One of the key reasons for developing this software was to enable us promote better statistical understanding across the world. Thus with the presence of this menu and with an increasing openness of data by governments (even in the developing nations) and corporations, students, civil society activists, anti-corruption officials etc can be able to use publicly available data to look for patterns and probably help in raising corruption red-flags after analysing the data. Mihaly used two datasets which are on the software's library: the World Bank prior reviewed contracts which was used by Masters students at African Institute of Mathematical Sciences, Bagamoyo, Tanzania when Dr Liz Dávid-Barrett, Senior Lecturer in Politics at University of Sussex visited the center in March 2017, and also the EU-wide TED database, each following a very similar structure. He demonstrated how data pertaining to one or a set of countries can be selected from R-Instat software. The students then jointly defined the red flags in the database which they learnt about earlier in the module. For example they picked single bidding and direct contracting procedure type as red flags and produced group averages for sectors, years, or larger buyers to explore where risks lie. Then they also visualised some of the selected red flags using histograms. The second part of the course revolved around student projects where groups of 4-5 people identified a research question and explored it in the class. They will have to submit their final paper in a few weeks time. For example, one interesting research question was around whether Romania's European Union accession increased or decreased corruption risks in World Bank funded procurement contracts over time. Quite interestingly, a simple before-after comparison revealed a significant increase in risks just after the accession date. The use of such technology has unique opportunities for openness and anti-corruption across the globe. However, to harness the benefits of using such technology, government's , anti-corruption watchdogs, activists and students have to be quick to conform and act. In some circumstances, policy changes to encourage open data initiatives by governments will be required. In other circumstances, the development of a breed of students with a skill set that is deeply analytical and equipped with requisite skills is needed. To do this, exposure to such technology while in school is vital.